Over the years, I’ve shared my journey with whole foods, organic, junk and everything in between. It’s a continuous balance of choosing that which is best for our family, yet making it manageable. When my teens were toddlers, I was smack dab in the throws of extremely healthy eating, and spent time and great care to do so. Those time choices just wouldn’t fit into our schedules now, so I am glad that new products have come out to help us along. For instance, I did a lot of research on great sources of calcium for my toddlers, in lieu of gallons and gallons of dairy. We dabbled with goats milk (yuck, but healthy) for a little before I landed on one of the best sources – almonds. Today, I consistently keep raw almonds on hand for snacks, but when the kids were little, obviously, they couldn’t chomp on almonds, so I made my own almond milk. Oh yes, I did!! I told you it took time – a lot of it, especially straining it through a cheese cloth to get it to a drinkable consistency, but I knew this was so healthy and good for them with more vitamins and calcium that dairy could give. Those days are long gone, and we always have gallons of dairy milk in our fridge, but I have never forgot the health benefits of almond milk, so when Silk first introduced it, I ran to try it and it’s been a hit ever since. The Vanilla Almond Milk is one of our favorites and our boys guzzle it a bit too quick for my liking. This is so much more though than just a healthy drink options, it’s perfect for entertaining. 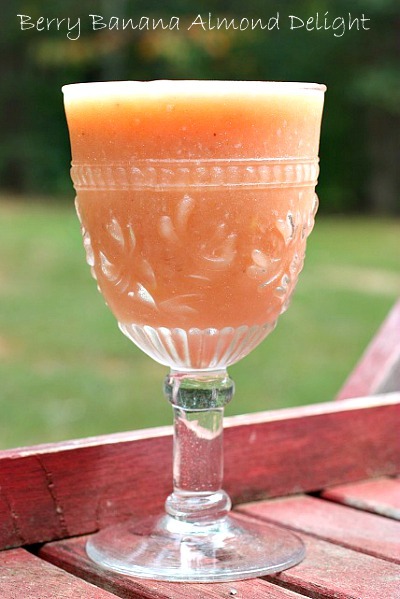 It’s so easy to whip up delicious and “fancy” drinks for all your get togethers. Yesterday was so hot and I treated myself to this Berry Pineapple Banana Delight. The pineapple was an extra addition when I realized that my girls had polished off almost all the strawberries I was planning on using. I whipped up ice, Silk’s Almond Milk, frozen pineapple, a few strawberries, two bananas, and then sprinkled it with my own garden’s blueberries and blackberries. i would love to try this drink you have made here for my next party! I would think any smoothie would be tastier and healthier using Silk in place of milk. I will be using Silk, especially Almond Silk in my smoothies. Wow that smoothie sounds delicious! I love almond milk. It’s yummy and very low in calories. I can’t believe you made your own – I had no idea you could do that. How awesome!